It's kind of hard to believe that Offend Maggie, Deerhoof's new record on the KRS (Kill Rock Stars) label - out on October 7th, will be their 13th professional release. Because of their individuality and ever-changing nature, I still find myself thinking of Deerhoof as a new band. They certainly keep it fresh. This fine indie rock band from San Francisco has proven to be one of the most prolific and talented of the era. And while Deerhoof is an acquired taste (and certainly a band's band) there is much to enjoy for beginners. Deerhoof's sonic meanderings are challenging and sophisticated. As time has passed and I look back on Deerhoof's accomplishments, I realize again that this is a band ahead of their time. Here's to hoping they finally get some well-deserved attention in 2008. 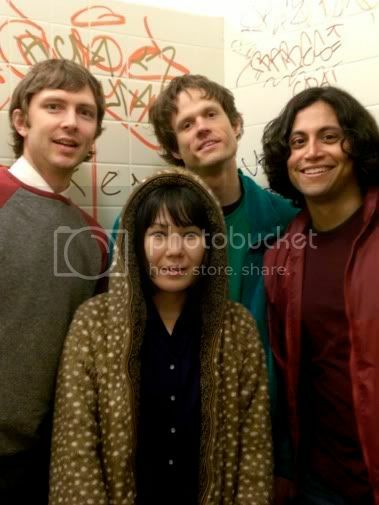 BONUS MATERIAL: According to Filter magazine, Deerhoof drummer Greg Saunier spent some time this year working with members of Wilco on the soundtrack for the new Will Ferrell and John C. Reilly comedy titled, "Step Brothers" set for a theatrical release in July. I don't have any of that music for you (yet) but I do have a link to the trailer.... (YouTube - "Step Brothers"). How's that for Extra Credit? !